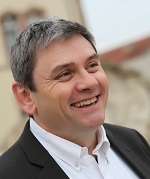 Hervé PINGAUD is graduated as engineer in 1983 and got a PhD in 1988 at Institut National Polytechnique de Toulouse (INPT) with a work on process simulation in the oil&gas industry. Then, he joined INPT as an assistant professor and worked on bioprocess control applications for ten years. From 1992, he has an increasing interest for industrial engineering. He acts as a project leader in developing new diploma in industrial engineering both in INPT, and in Ecole des Mines d’Albi Carmaux, institution that he joined for a new position of full time Professor in 1999. From 1999 to 2010, in the “Centre de Génie Industriel”, he published and supervised many PhD students in three scientific topics : enterprise process modelling, process and risk management, and collaborative information system design. He has been a member of InterOp Vlab scientific council, and has chaired its scientific council, has also been a french representative of IFAC TC 5.3 “Enterprise Networking and Integration”.